Affordable housing typically gets a bad name. NIMBYism has created barriers and challenges for new affordable housing units. Residents and homeowners fear the thought of allowing lower income residents into their community. Failed public housing projects have led to the increased concentration of crime, blight, and stigma which is often associated with affordable housing developments. The residents of these communities are not solely to blame for the issues surrounding their housing needs. Landlords and real estate investors have control over residents and the outcome of their property. Think about the concept of monopoly the game. In real estate investing the owner of the property makes the decisions. The opportunity to select the resident, the level of improvements to the property, and ongoing management of the property is up to the landlord. Stable rental income is essential for real estate landlords. While there’s been an 18 percent increase in the number of low-income households from 2007 to 2013, funding for the largest HUD program remains below 2008 levels. A opportunity for a tenant base exists by providing housing to low-income households using government subsidy programs. Such programs pay landlords directly on behalf of the resident. Accepting residents on the section 8 voucher program is not only a form of public service but also can provide as a secure form of passive income. In our experience, there are both pros and cons to renting to both market rate tenants and section 8 voucher holders. As an investor you must determine which tenant and demographic aligns with your real estate investing business plan. How would it feel to receive a guaranteed payment every month? Never worry if the rent will be late or only a partial payment. Never be concerned of excuses from tenants. Never fear reliance on tenant money management skills. This would be wonderful, we know! This is the reality of being a landlord that accepts residents using the section 8 voucher program. The local public housing authority (PHA) insurers that you as a landlord receive the full portion of the rent that they have agreed and are responsible for paying. There are no location restrictions on where residents may use a section 8 voucher. It is solely up for the landlord’s discretion. If the landlord is willing to participate in the program and allow the resident an opportunity to reside in their rental unit, then they can participate. Often known simply as Section 8, in reference to the Section 8 of the Housing Act of 1937, approves or authorizes rental housing assistance payment to private landlords. This piece of legislation benefits millions of low-income families and households in the United States. As of 2008, the number of these low-income households was about 4.8 million. The Housing Choice Voucher program is the largest portion of the section, and pays a significant fraction of the rent and utility payments for approximately 2 million households. This program offers ‘tenant-based’ rental assistance. The amount that the government will pay is based on the resident income (if there is any). The federal government guarantees to shoulder the difference between the amount the resident can comfortably contribute towards the rent and the market rental rate of the property. Tenant’s Obligations: When a prospective resident obtains a voucher, it denotes an approved rental amount that a family can use their funds towards. The family views and selects a housing unit and notifies the housing authority. Next, the Public Housing Authority conducts an inspection and approves or denies the unit and lease. The family must complete the landlord leasing process and upon approval, sign a lease with the landlord for at least one year. The family may be required to pay a security deposit to the landlord out-of-pocket to reserve the rental unit. After the first year the landlord may initiate a new lease or allow the family to remain in the unit on a month-to-month lease. When the family is settled in a new home, the family is expected to comply with the lease and the program requirements, pay their share of rent on time, maintain the unit in good condition and notify the public housing authority of any changes in income or family composition. Landlord’s Obligations: The role of the landlord in the voucher program is to provide clean, safe, and sanitary housing to a tenant at a reasonable rent. The housing unit must pass the program’s housing quality standards and be maintained up to those standards as long as the owner receives housing assistance payments. In addition, the landlord is expected to provide the services agreed to as part of the lease signed with the tenant and the contract signed with the public housing authority. We caution you to not stigmatize these residents for their lifestyle or living habits. Keep in mind, they are not real estate investors. They do not have enough income to pay for their family’s home and someone else’s. This means that you may not be as familiar with the lifestyle habits people who come from a lower socio-economic status. Keep in mind that we are all people, and we each have the liberty to live life on our own in terms (whether or not we personally agree with them). To put it plainly, mind your business, don’t try to control the details of your resident lifestyles and allow the peace of mind that comes from receiving a secured, consistent payment to keep you motivated. Remember, you can always hire a property manager if you don’t plan to deal directly with tenants. 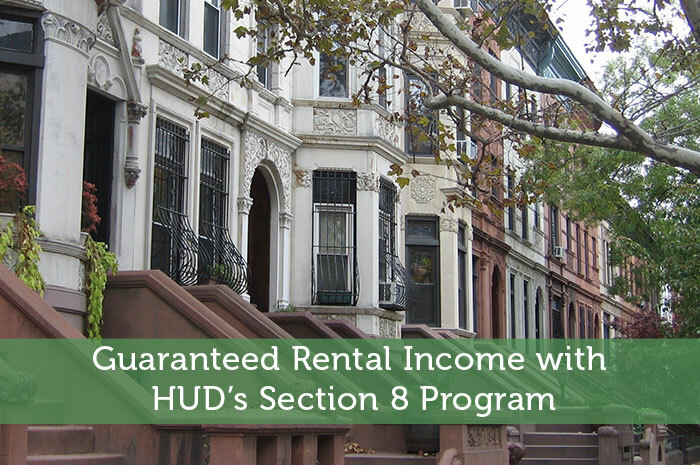 Obviously, there are great benefits that come with renting investment property with HUD’s Section 8 Housing Programs, both for the landlord and the tenant. In order to learn more about how to use this section for rental purposes, we suggest you contact your local housing authority to learn more about the requirements and qualifications. Be sure to read all the rules and regulations and understand them very well before leveraging this housing program. This way, you can be sure of reaping the benefits that ensue without any form of hassle.